Vegan Bytes #50- Does this happen to you too? Vegan Bytes #50: Do Your Homemade Burgers Fall Apart in Your Hands? **Note: Some email servers don't allow you to click these links above. If that's the case with you, just scroll down in your email to the sections you want to read. If you're a curious vegan like me, or someone who came to the plant-based world because you learned about the health benefits, you've read stories about people who cured cancer by eating a vegan diet. In some cases you might be a survivor yourself, or might know someone who has beaten the odds by changing what they put in their bodies. But do you know the absolute best foods to eat to prevent or cure cancer? Dr. Fuhrman popularized the anti cancer diet, and it's making waves around the world. You have to read this now if you know someone dealing with a critical illness... there might be a way to change their fate that no one else has told them about. The Chicago Diner is probably the most famous vegan restaurant in Chicago, and for good reason; it's been "meat free since '83." That's a lot of time spreading the vegetarian word around town! I've been to Chicago twice, and that means I've also been to The Chicago Diner twice. The first time we dined in at one of their cute, red, retro diner booths, and the second time we picked up carry out and brought it to a Cubs game. Both times we ordered a lot of food, so I have a pretty good feel for their menu and was therefore excited to write a review of it. 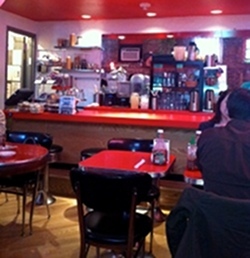 Find out what I think of The Chicago Diner here. This is one of those simple questions that occur to most people when they're traveling or on the run somewhere. Is there anything in bagels that would make them un-vegan? People are always wondering if bagels are vegan, and there's a quick and simple answer here. Whether you've been vegan for 25 days or 25 years, you've probably eaten quite a few vegan black bean burgers. 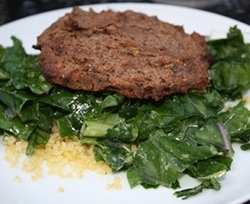 It tends to be the vegan option on most restaurant menus, right behind the hummus sandwich and the grilled portobello. But, just because we've all had many run-of-the-mill, boring black bean burgers doesn't mean we can't create our own at home that are absolutely fantastic. I love this burger recipe because it has a great smoky flavor, it's incredibly easy to put together, and because it sticks together! I haven't tried it, but you could probably even stick it on the grill once it's mostly cooked, which is really saying something for a homemade black bean burger that has no soy products, "fake" meats, or binders in it. Try this vegan burger recipe for yourself and let me know how you like it in the comments section at the bottom of the page. 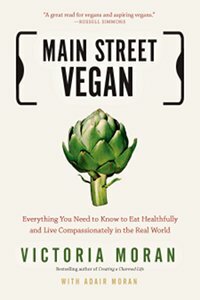 Main Street Vegan is Victoria Moran's eleventh book and is absolutely packed with information on veganism. 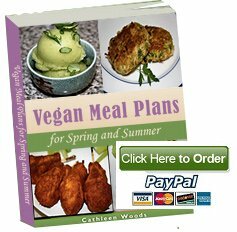 She was voted one of the most influential vegetarian writers and has been a vegan for over 30 years, so her experience has earned her the right to write on the variety of topics included, ranging from steps to going vegan and the discussion of animal treatment on farms to tips on vegan travel and lifestyle issues like clothes, shoes, toiletries, and cosmetics. What I was most blown away by was her age. You will be absolutely shocked when you see a picture of her and then find out how old she is. Gotta love the vegan diet for slowing aging! 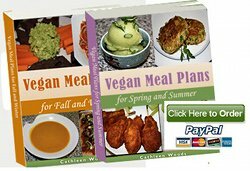 Learn about Victoria Moran and check out my review of her latest book, Main Street Vegan, here.